Whichever wise man (or woman) said the above proverb knew that knowledge is absolutely useless when it goes unshared. Knowledge sharing is a deeply important concept that allows organizations to thrive. Companies like Atlassian and Tettra are built on the entire concept of knowledge sharing. But does sharing knowledge impact revenue? 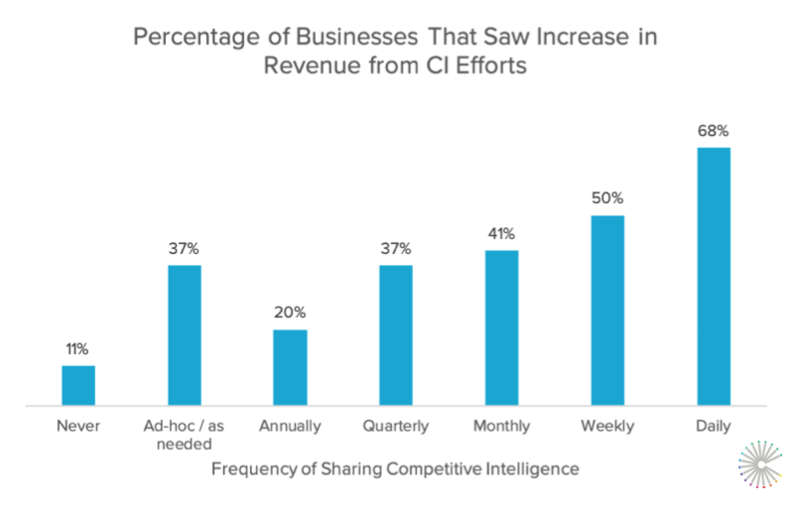 Well, if you get the chance to read our 2019 State of Competitive Intelligence report, you’ll learn that sharing competitive intelligence (CI) is of the utmost importance and a major factor in driving revenue. We surveyed over 1,000 CI, marketing, and sales professionals, and found that frequently sharing intel was the key to success for many CI programs.Our survey found that the more frequently intel is shared, the more likely a business was to see revenue increase as a result of their CI program. Those who shared intel daily were 36% more likely to see a revenue increase than those who shared intel weekly, and those who share intel daily are 84% more likely to see a revenue increase than those who share intel on an ad-hoc basis. So the takeaways here is that sharing (not hoarding) competitive intelligence is the key to increasing revenue. Now that we know that, what are the most effective methods to share CI with your sales team and stakeholders? Thanks to technology, there are hundreds of ways to share information across an organization, but when it comes to CI, traditional methods remain the business favorites. 79% share intel by email and 62% share intel live, in meetings. “Non-traditional” methods such as Slack, Wiki, and CRM lagged behind the traditional modes of communication, but a respectable portion of the respondents still said they utilized those methods. Let’s dig into each of these methods and the best way to utilize them. Email. You know it. You love it. You check it first thing in the morning and last thing before bed. 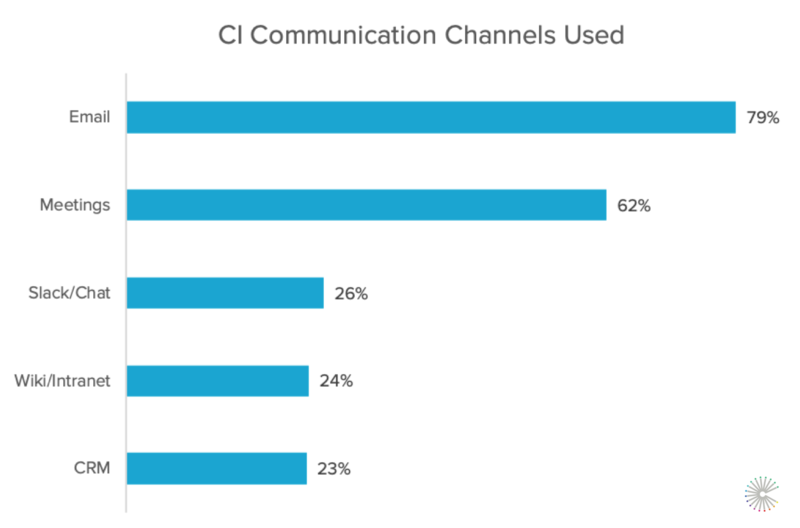 Our survey found that email was by far the favorite channel for sharing CI, with 79% of respondents saying that it was their number one preferred channel. However, email inboxes can get crowded, so you’ll want to take a more summary approach as opposed to throwing every single CI update over the fence—you don’t want people to tune you out. A good approach for sharing CI via email is a summary or “round-up” approach that condenses all the CI happenings into one simple view. This allows your colleagues to see the most important CI updates that happened in that specific timeframe. Whether it’s daily or weekly, consistently sharing a round-up full of actionable intel will build your credibility with your team, and get them into the habit of receiving top-notch competitive content from you regularly. Make the most of your weekly or monthly meetings by dedicating a section to sharing and discussing competitive updates. For weekly and/or frequently occurring meetings, you’ll want to take a condensed round-up approach (similar to email) with actionable takeaways for your team. Focus on areas where there are great opportunities for the company to improve – this is how you get leverage from a competitive analysis. Call out areas of strength where the company can double down to go even faster. Call out areas of weakness to identify where the company has not focused but could in order to keep up with competitors. This type of deep dive will help inform product, sales, and marketing teams as well as executive stakeholders. HubSpot is infamous for its internal wiki, and as a former HubSpotter myself, I can attest to how effective and fruitful it is to have a thriving wiki as part of your company culture. Wikis are the perfect place to share knowledge because it’s accessible to everyone, it often replaces the need to have a meeting, and—perhaps most importantly—it acts as a historical record for the evolution of your company. Thus, it’s the perfect place for your CI updates. Much like email, wikis are a great place to offer a round-up on competitive intelligence. And unlike email, it has a bit more staying power—pages stay up there forever for folks to like, comment, and share. In addition to using wiki posts as a CI round-up, you can also use it as a supplement to your other CI materials. For instance—that big CI analysis presentation you did at the monthly meeting? Make a supplemental wiki post that summarizes your findings and for people to refer back to later. The best way to get sales to act on information is to simply be where they are at all times. Given that they are probably spending most of their time in your company’s CRM, the more valuable intel that you can integrate into your CRM, the better. Getting your competitive content (battlecards, competitor profiles, etc.) into your CRM is an effective way to ensure that sales is not only leveraging this material, but that they also have the correct competitive information right at their fingertips to use with prospects. It will take some time to learn which of these sharing methods works best for you and your team. For qualitative data, talk to your sales team and other stakeholders about which sharing methods they find keeps them engaged. It can be challenging to quantify the effectiveness of your sharing methods, but you can look at your overall competitive win rates to see if they have moved meaningfully in either direction. Since many factors affect your competitive win rates, you can supplement with usage metrics where available, for example, Open- and Click-Through-Rates on your CI round-up emails or views on your wiki posts.